Mr.T1 – Determine Your Bandwidth Speed With Mr.T. | JONAH BRUCKER-COHEN, PH.D. Mr.T1 – Determine Your Bandwidth Speed With Mr.T. – JONAH BRUCKER-COHEN, PH.D.
UPDATE – now version 1.1 is ready for download! Here’s some information on version 1.0 of Mr. T1, a project I launched that fits into the larger theme of parasitic networks (both hardware and software) I’ve been working on. “Mr. T1” is a bandwidth meter detector/monitor that runs as a standalone, cross-platform (OSX, Linux, Windows) application. 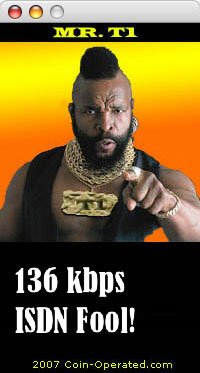 The project constantly checks the current speed of the connected network and if it reaches that of a standard T1 line (1.5mbit/sec) or higher then a Mr.T sound sample is triggered in the form of “I Pity The Fool” or one of Mr.T’s other various sayings. 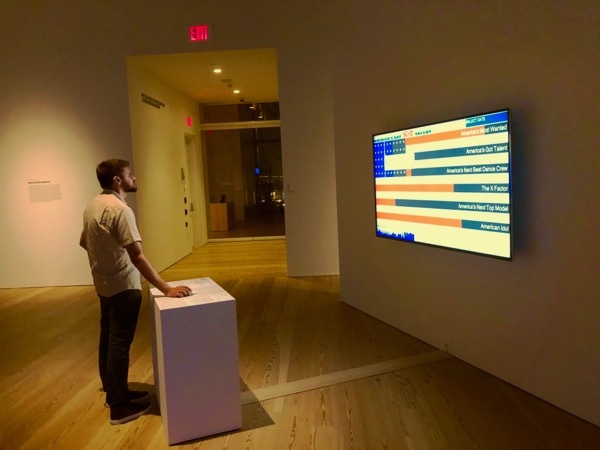 The project playfully examines the metaphorical connection between fictional characters from mainstream entertainment media and the naming conventions of modern communication systems such as the Internet. It also stems from my experience of working in many different lab environments where bandwidth speed has always been an issue concerning people using shared Internet resources.